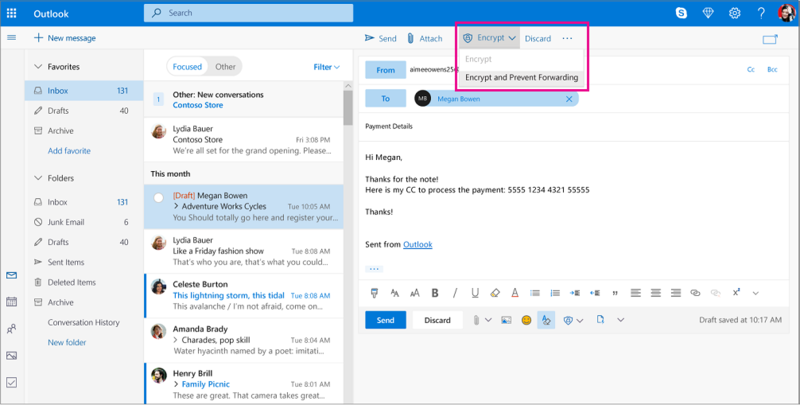 If you have an Office 365 Home or Office 365 Personal subscription, Outlook.com now includes encryption features that let you share your confidential and personal information while ensuring that your email message stays encrypted and doesn’t leave Office 365. This is useful when you don’t trust the recipient’s email provider to be secure. The encryption options are available in the ribbon when you're composing a message. What encryption options are available? Encrypt: Your message stays encrypted and doesn’t leave Office 365. Recipients with Outlook.com and Office 365 accounts can download attachments without encryption from Outlook.com, the Outlook mobile app, or the Mail app in Windows 10. 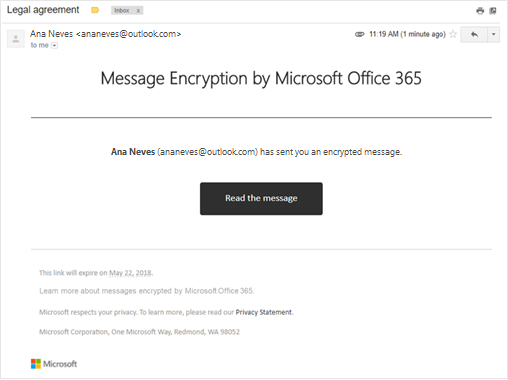 If you're using a different email client or other email accounts, you can use a temporary passcode to download the attachments from the Office 365 Message Encryption portal. How do I send an encrypted email message? To send a message with encryption, choose one of the two options available under the Encrypt button: Encrypt or Encrypt and Prevent Forwarding. If you’re using Outlook.com or Office 365 and are using the Outlook.com website, the Outlook mobile app, or the Mail app in Windows 10, you can read and reply to encrypted messages the same way you do with unencrypted messages. If you're using Outlook for Windows, Outlook for Mac, or a third-party email app, you’ll receive an email message with instructions for how to read the encrypted message. You can gain access using your Microsoft account or your Office 365 account. You'll receive an email message with instructions for how to read the encrypted message. If the encrypted message was sent to a Google or Yahoo Mail account, you can authenticate using your Google or Yahoo account or by using a temporary passcode. If the message was sent to a different account (Comcast or AOL, for example) you can use a temporary passcode. The temporary passcode will be sent to you in email. All attachments are encrypted. Recipients who access the encrypted email via the Office Message Encryption portal can view attachments in the browser. If you choose the Encrypt option, recipients with Outlook.com and Office 365 accounts can download attachments without encryption from Outlook.com, the Outlook mobile app, or the Mail app in Windows 10. Other email accounts using a different email client can use a temporary passcode to download the attachments from the Office 365 Message Encryption portal. Microsoft Office attachments such as Word, Excel or PowerPoint files remain encrypted even after they’re downloaded. This means that if the recipient downloads the attachment and sends it to someone else, the person they forwarded it to won’t be able to open the attachment because they don’t have permission to open it. Note that if the recipient of the file is using an Outlook.com account, they can open encrypted Office attachments on the Office apps for Windows. If the recipient of the file is using an Office 365 account, they can open the file in Office apps across platforms. All other attachments, such as PDF files or image files, can be downloaded without encryption. How is this different from the current level of encryption in Outlook.com? Currently, Outlook.com uses opportunistic Transport Layer Security (TLS) to encrypt the connection with a recipient’s email provider. However, with TLS, the message might not stay encrypted after the message reaches the recipient’s email provider. In other words, TLS encrypts the connection, not the message. Additionally, TLS encryption didn’t provide the ability to preventing forwarding. Messages encrypted with Office 365 stay encrypted and remain inside the Office 365 service. This helps secure your email when it’s received.